I have been painting kitchen cabinets for what feels like forever! We have a ton of cabinets and I have been doing the entire kitchen in sections. I thought I would break down the process for anyone that is going to tackle this project. It is not hard but proper preparation is critical and time consuming. So, grab your supplies and jump right in! Remember that some links below may be affiliate links which means that you do not pay anymore, however, a portion of your purchase will go to support this site. Read this guide entirely and make sure you understand each step. Gather all of your supplies so everything is on hand once you get started. Work in small sections as tackling your entire kitchen at once might drive you crazy. Start your prep work first! These steps go for painted or just stained cabinets. Do not skip this section as it is critical to the success of your project. Remove all knobs. I actually do not recommend that you remove the doors as hanging them again can be a pain. If you do, be sure to remove just the door and leave the hinge in place. Start by cleaning your cabinets really well. Like they have never been cleaned before. Use a sponge and a bucket with cleaner. Get into the cracks and crevices with an old toothbrush. Use a magic eraser for stubborn dirt. Clean ALL surfaces that you are going to paint. Next comes sanding. You will want to sand EVERY surface. I prefer hand sanding as you are not removing the finish, just roughing it up for paint adhesion. I use a piece of sand paper wrapped around a sanding sponge and secured with tape for a majority of the cabinet. Then come back with just a piece of sandpaper for those detailed areas. Now you may think you are done but oh no! It is time to clean again! This time you are cleaning with TSP. Be sure to wear protective gloves and follow all instructions on the package. This is a really heavy duty cleaner and you do not want it on your skin. Protect your floor before starting this step. Do not apply this to anything that will not be painted. Rub on with a sponge, allow to sit a few minutes, then dry with clean paper towels. Continue until every surface has been cleaned again. Allow everything to dry completely before moving on to painting. You are finally ready for paint! The steps above will take you a while. You may want to break the prep and painting into two different days if possible. If not, tackle it all in one fun filled day and step back to look at all you have accomplished. The number one question is always what type of paint to use on kitchen cabinets. First, if you are painting wood cabinets for the first time, be sure to prime them first. It does not matter if you are using a paint and primer in one! They need a primer! I would recommend Kilz Adhesion Primer for cabinets. Also, if your paint is so worn that the wood is showing through in several areas, consider adding the primer step as well. Better safe than sorry! When it comes time to paint, I highly recommend HGTV Home by Sherwin Williams High Gloss Paint. You can find it at Lowe’s and it is a really great paint for cabinets. It is a paint and primer in one and can be used indoors or out. Have them tint it to the color you want for your cabinets in store. Protect your work area with paper or plastic and some painter’s tape. If you have cabinets that have never been painted or wood showing through your finish, be sure to start with a primer. Use small brushes to get in details and around hinges. Then use a small roller to finish off cabinets. You can use a paint sprayer for doors if you removed them. Allow this to dry completely before continuing. Give the cabinets a light sanding after priming with a fine grit sandpaper. Wash down and dry after sanding to ensure you clean up all sanding dust. Now it is finally time to paint! Again use small brushes to get in details and around your hinges. Use a small roller to finish off the paint. Again, if you have a paint sprayer and removed the doors, you can use that as well. Dry time! This is important! Dry time and cure time are two different things when it comes to paint. The cabinets may be dry to the touch in an hour or so but the paint is not cured. The first 24 hours are critical. You can really damage the uncured paint during this time. I recommend leaving the doors open or off this entire time. Leave the hardware off as well. And also try to use the cabinets as little as possible during this time. Doing this will ensure that your paint is cured before any use. 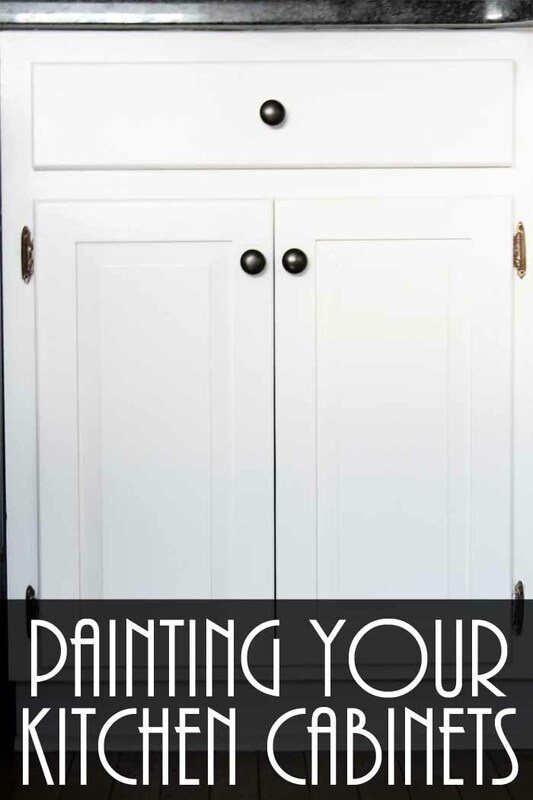 You now have gorgeous painted kitchen cabinets that you can be proud of! If you have been following along with our kitchen remodel, we have already completed tile removal on our counters and installed new counters. I am almost done painting kitchen cabinets and then we are moving on to the back splash. Stay tuned for more details and of course a reveal when it is done! If you have any further questions about painting kitchen cabinets, be sure to leave them in the comment section below. Good luck and happy painting! You might also like these DIY conversion charts that I put on the inside of my cabinet doors or my idea for storage of plastic lids here.